Simulated image of the nanoreporter bound to molecules of cholesterol (yellow-green). From Galassi et al., Sci. Transl. Med. 10, eaar2680 (2018). Reprinted with permission from AAAS. When the nanosensors are injected into a mouse, the liver filters them out of the blood and then are consumed by the organ’s lysosomes. Shining a near-infrared flashlight-like device on rodents injected with these nanosensors causes the sensors to glow. The color of the light corresponds to the fat content in the liver, allowing Dr. Heller and his colleagues to measure fat non-invasively using the device. In addition to measuring disease progression, these nanosensors may also help accelerate research on fatty liver disease and its treatment. 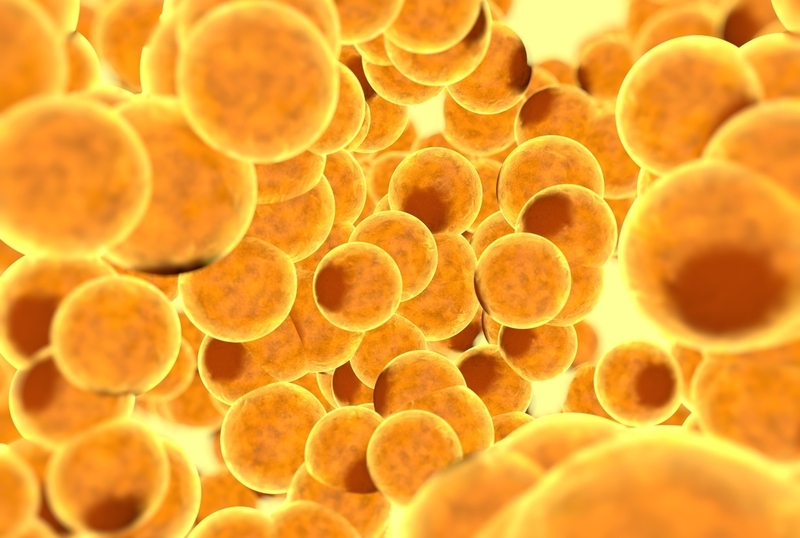 “A biosensor that could detect this type of fat accumulation could accelerate research towards treatments for fatty-liver disease and other lipid-linked conditions, and potentially lead to improved diagnostics as well,” Dr. Heller said. The work was conducted in the Heller Laboratory and Dr. Schwartz’s laboratory at Weill Cornell Medicine, as well as collaborators at Memorial Sloan Kettering, the Washington University School of Medicine, Lehigh University, the University of Rhode Island, and the National Institute of Standards and Technology. Dr. Heller is a co-founder and officer of LipidSense Inc., a company that develops in vivo assessments of lipid accumulation. He is also named on a patent application filed by Memorial Sloan Kettering Cancer Center related to this work. In addition, Dr. Heller is a cofounder and officer with equity interest in Goldilocks Therapeutics Inc., as well as a member of the scientific advisory board of Oncorus Inc., two companies that are unrelated to this work.